Banana is the fruit that smiles at you whether or not you eat it. This curvy, yellow fruit which is simply delicious to eat and loaded with vital nutrients was first domesticated in Papua New Guinea. Archaeological evidence suggests banana cultivation to go back to at least 5000 BCE. In India, bananas are grown in Maharashtra, Tamil Nadu, Karnataka, Andhra Pradesh, Gujarat and Assam. Globally, India ranks first in banana production by producing about 14 million metric tonnes annually. The edible modern varieties of banana are Musa acuminate and Musa balbisiana although there are several other varieties that are found. Natural hybrids of these two varieties are also cultivated commonly. Banana crop is a tropical fruit that can grow in alluvial soil and volcanic soil. Since India has a tropical climate most of the year, it can grow almost all year round. Banana grows at an altitude of 1200 meters from sea level in a warm and humid climate. 20⁰C- 35⁰C is the most favorable temperature range along with a high level of humidity for banana farming in India. The growth gets retarded below 20⁰C and above 35⁰C. They take longer time to mature in cooler climates while the growth and yield is reduced at lower humidity and temperature. An average annual rainfall of 1700 mm distributed evenly throughout the year favors good growth and satisfactory yield. For successful banana plantation, good porous, fertile soil with rich organic content is necessary since it is a heavy feeder. In addition, they have a restricted root zone therefore; drainage and depth of the soil are two important factors that must be considered. In addition to having a good drainage capacity, the soil must be able to retain moisture and have a pH of 6.5-7.5. The nitrogen content of the soil must be high along with adequate levels of potash and phosphorus. 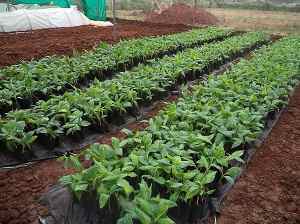 Black loamy soil of Maharashtra, clayey heavy soil along the Cauvery delta region, the alluvial soil of the Gangetic plains, sandy loam of Kerala and red laterite soil in the hilly regions of Kerala are ideal for banana plantation. Needless to say, these areas are well-known for banana cultivation. 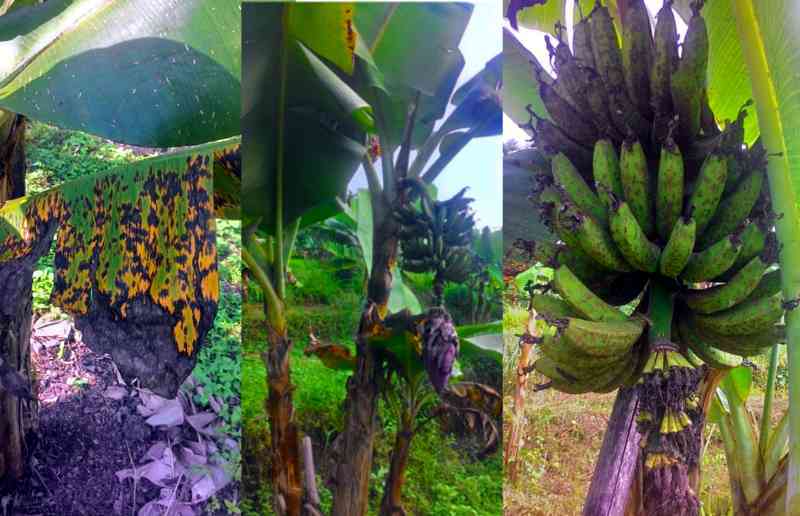 Alkaline or acidic soils are not good for banana farming. A neutral pH of 6.5 to 7.5 must be maintained for banana crop. For the entire life cycle of banana it needs 900-1200mm of water. This is generally met through rainfall and whatever extra is needed it is provided through irrigation. It is important to maintain the moisture level at optimum during all growth stages and also drain out the excess water from the root zone. This is important from the point of view of growth and productivity of banana tree. Irrigation is done once a week when the climate is cool and once in every 3 days under hot conditions. Drip irrigation, trench irrigation and flood are some of the common irrigation systems followed for cultivation of banana. Each of them have their own merits and demerits. However, the most economical and popular one is drip irrigation. This is because they ensure water being dispensed at the root zone. Banana is a heavy feeder. Therefore, having a long term banana plantation might not be a very beneficial form of farming at all. Bananas are hence rotated with crops like sugarcane, paddy, pulses, vegetables, etc. This helps soil to regain the fertility, ensure vitality and to some extent weed control. The period of crop rotation varies from 2-3 years on an average. Intercropping is the most commonly followed practice in banana cultivation. While it ensures the health of the soil, it also provides substantial income for the farmers. In coastal areas like Karnataka and Kerala, banana is intercropped with coconut and arecanut. Ginger, pepper, elephant-foot yam, nutmeg are other crops that are cultivated along with banana. When choosing the intercrop farmer should consider the growth of banana plants. Farmers most commonly use suckers as the planting material. Some of them also practice tissue culture banana cultivation using seedlings developed through tissue culture. 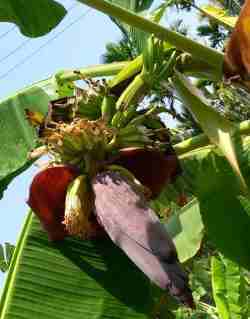 Rhizomes and peepers are the other planting materials used for banana cultivation. There are two types of suckers, viz., sword sucker and water sucker. However, fruits produced through water suckers are of inferior quality and hence not used in commercial farming. Sword suckers are attached to the mother rhizome superficially and have broad leaves right from early stages. Suckers used for propagation must weigh 450-700 gm and must have a well-developed rhizome, conical in shape with an actively growing conical bud. 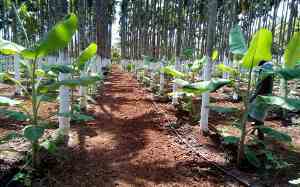 To maintain a disease-free, healthy, high yielding banana plantation some farmers also use tissue culture banana plants. No male flowers, so whole axis covered with fruits. Resistance to leaf spot, Fusarium wilt and burrowing nematode. Black Sigatoka, Fusarium wilt and apparently resistant to burrowing nematode. Apart from these there are other varieties like Saba, Grand Naine, Ney Mannan, Chakkarakeli, Rasthali, Virupakshi, Sirumalai, etc. that are cultivated owing to their popularity as dessert and culinary varieties. The land is tilled and ploughed so as to break down the soil clods. Stones, rocks and other debris must be removed. The land must be a fine tilth. Sometimes the fields are ploughed thoroughly till the soil becomes a fine tilth. Pits measuring upto 1.5 feet in depth are dug and exposed to sun for 2-3 days. This process helps in controlling weeds. Some farmers pack the pits with farm yard manure, phorate and neem cake, irrigate the field and then leave it as such for 3-4 days. This step helps the manure to get mixed with soil and also settle the loose soil. In places where there is high humidity but temperature can fall upto 5⁰C, the distance is kept t 2.1 X 1.5 m.
The most common method of planting followed is pit planting. The pits are modified as per planting requirement using manure, gypsum and neem cake. The suckers are planted at the center of the pit and soil is spread around it so as to pack it tightly. Deep planting in banana cultivation must be avoided. The fields are irrigated 3-4 days before planting and immediately after planting. 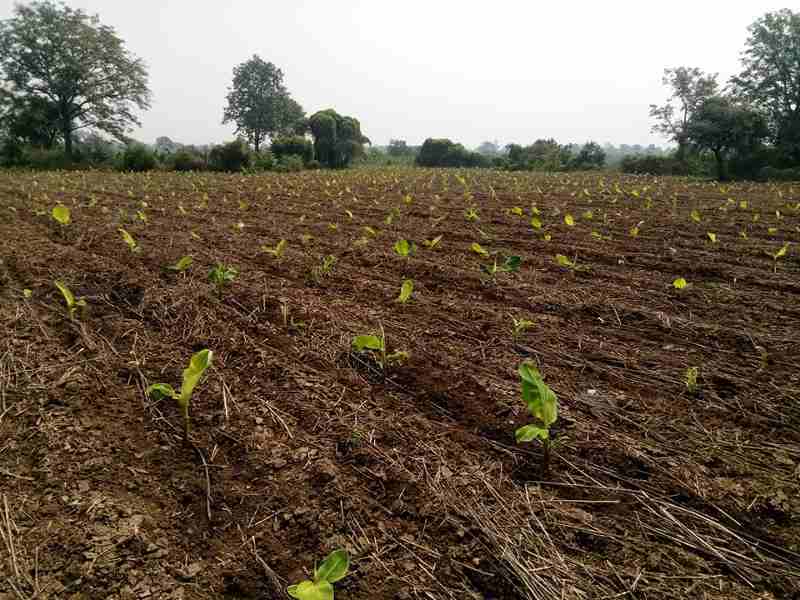 Along the Cauvery delta region, trench planting is practiced while furrow planting is done in annual planting system in Maharashtra and Gujarat. Spraying 0.2% Chlorothalonil and 1% Bavistin 4 times in 15 day interval. Apart from the above enlisted diseases, other diseases like Banana Bunchy Top Virus (BBTV), Head rot, heart rot, crown rot, stem rot, etc. also affect banana crops. There are different insect and pests like caterpillar, aphids, nematodes, etc. that also affect the banana crop. While there are various chemical sprays, insecticides and fungicides available in the market, manual inspection of the crop at regular intervals and intercropping are the best ways to control and manage the diseases. Irrigation in banana crop is stopped about a week or so before harvesting. This will help soil to dry up and easier labor movement. 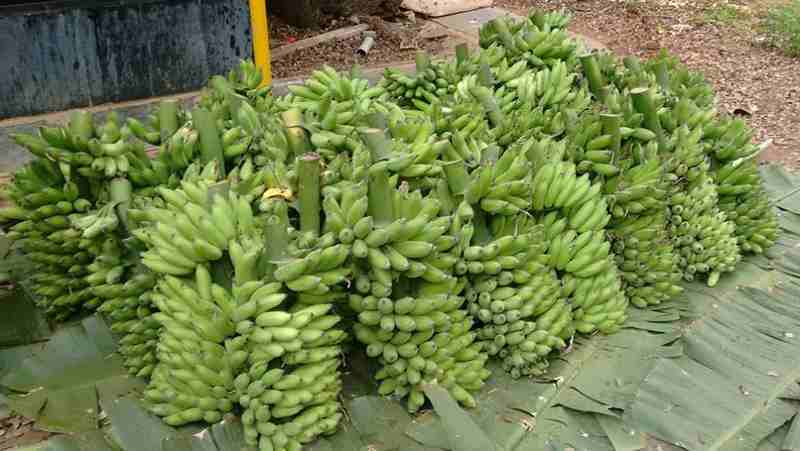 While the banana bunches are cut from the fields, other operations like cutting the hands, application of fungicides, etc. must be carried out in the shade. Sunlight may prove detrimental to the shelf life of bananas. The bunch must be 75% ripe, whole, and free from injuries, blemishes and green in color. The bunch is cut with a single stroke and the latex is allowed to flow freely. Once the flow stops, they are carried to sheds and must not be allowed to come in contact with the soil. Therefore, they are placed on leaves spread on the ground. Once the treatment is done, they are packed in gunny bags. Those having a poor shelf life are sent immediately to the market while those that can last upto a week are stored in cool conditions. Banana cultivation in very profitable and viable agribusiness if planned well. The yield as per research is approximately 25 tonnes per acre. Sometimes the yield can be higher.